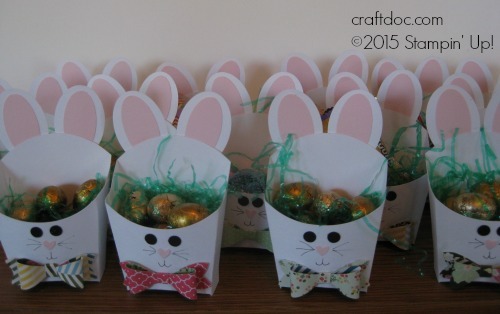 To go with the Curvy Keepsakes Box Chicks from the last post, here are my Fry Box Bunnies. Don’t you love Stampin’ Up! dies and the creative ideas people come up with to CASE? -Sale-A-Bration ends tomorrow! So don’t miss out on your freebies at my website SHOP. – I used the 2 oval punches, the bow builder punch and the owl punch (eyes and nose) here. – I hand drew the whiskers and mouth with the Project Life pens.